Each capsule contains 0.5 mg of tacrolimus (as monohydrate). The printing ink used to mark the capsule contains trace amounts of soya lecithin (0.48% of total printing ink composition). Each capsule contains 1 mg of tacrolimus (as monohydrate). Each capsule contains 5 mg of tacrolimus (as monohydrate). Opaque light yellow hard gelatin capsules imprinted in red with “0.5 mg” and “[f] 607”, containing white powder. Opaque white hard gelatin capsules imprinted in red with “1 mg” and “[f] 617”, containing white powder. Opaque greyish red hard gelatin capsules imprinted in white with “5 mg” and “[f] 657”, containing white powder. Prophylaxis of transplant rejection in liver, kidney or heart allograft recipients. Treatment of allograft rejection resistant to treatment with other immunosuppressive medicinal products. Tacrotaj therapy requires careful monitoring by adequately qualified and equipped personnel. The medicinal product should only be prescribed, and changes in immunosuppressive therapy initiated, by physicians experienced in immunosuppressive therapy and the management of transplant patients. Inadvertent, unintentional or unsupervised switching of immediate- or prolonged-release formulations of tacrolimus is unsafe. This can lead to graft rejection or increased incidence of side effects, including under- or over-immunosuppression, due to clinically relevant differences in systemic exposure to tacrolimus. Patients should be maintained on a single formulation of tacrolimus with the corresponding daily dosing regimen; alterations in formulation or regimen should only take place under the close supervision of a transplant specialist (see sections 4.4 and 4.8). Following conversion to any alternative formulation, therapeutic drug monitoring must be performed and dose adjustments made to ensure that systemic exposure to tacrolimus is maintained. The recommended initial dosages presented below are intended to act solely as a guideline. Tacrotaj dosing should primarily be based on clinical assessments of rejection and tolerability in each patient individually aided by blood level monitoring (see below for recommended target whole blood trough concentrations). If clinical signs of rejection are apparent, alteration of the immunosuppressive regimen should be considered. Tacrotaj can be administered intravenously or orally. In general, dosing may commence orally; if necessary, by administering the capsule contents suspended in water, via nasogastric tubing. Tacrotaj is routinely administered in conjunction with other immunosuppressive agents in the initial post-operative period. The Tacrotaj dose may vary depending upon the immunosuppressive regimen chosen. It is recommended that the oral daily dose be administered in two divided doses (e.g. morning and evening). Capsules should be taken immediately following removal from the blister. Patients should be advised not to swallow the desiccant. The capsules should be swallowed with fluid (preferably water). Capsules should generally be administered on an empty stomach or at least 1 hour before or 2 to 3 hours after a meal, to achieve maximal absorption (see section 5.2). To suppress graft rejection, immunosuppression must be maintained; consequently, no limit to the duration of oral therapy can be given. Oral Tacrotaj therapy should commence at 0.10 – 0.20 mg/kg/day administered as two divided doses (e.g. morning and evening). Administration should commence approximately 12 hours after the completion of surgery. If the dose cannot be administered orally as a result of the clinical condition of the patient, intravenous therapy of 0.01 – 0.05 mg/kg/day should be initiated as a continuous 24-hour infusion. An initial oral dose of 0.30 mg/kg/day should be administered in two divided doses (e.g. morning and evening). If the clinical condition of the patient prevents oral dosing, an initial intravenous dose of 0.05 mg/kg/day should be administered as a continuous 24-hour infusion. Tacrotaj doses are usually reduced in the post-transplant period. It is possible in some cases to withdraw concomitant immunosuppressive therapy, leading to Tacrotaj monotherapy. Post-transplant improvement in the condition of the patient may alter the pharmacokinetics of tacrolimus and may necessitate further dose adjustments. Increased Tacrotaj doses, supplemental corticosteroid therapy, and introduction of short courses of mono-/polyclonal antibodies have all been used to manage rejection episodes. If signs of toxicity are noted (e.g. pronounced adverse reactions – see section 4.8) the dose of Tacrotaj may need to be reduced. For conversion to Tacrotaj, treatment should begin with the initial oral dose recommended for primary immunosuppression. For information on conversion from ciclosporin to Tacrotaj, see below under “Dose adjustments in specific patient populations”. Oral Tacrotaj therapy should commence at 0.20 – 0.30 mg/kg/day administered as two divided doses (e.g. morning and evening). Administration should commence within 24 hours after the completion of surgery. If the dose cannot be administered orally as a result of the clinical condition of the patient, intravenous therapy of 0.05 – 0.10 mg/kg/day should be initiated as a continuous 24-hour infusion. An initial oral dose of 0.30 mg/kg/day should be administered in two divided doses (e.g. morning and evening). If the clinical condition of the patient prevents oral dosing, an initial intravenous dose of 0.075 – 0.100 mg/kg/day should be administered as a continuous 24-hour infusion. Tacrotaj doses are usually reduced in the post-transplant period. It is possible in some cases to withdraw concomitant immunosuppressive therapy, leading to Tacrotaj-based dual-therapy. Post-transplant improvement in the condition of the patient may alter the pharmacokinetics of tacrolimus and may necessitate further dose adjustments. Tacrotaj can be used with antibody induction (allowing for delayed start of Tacrotaj therapy) or alternatively in clinically stable patients without antibody induction. Following antibody induction, oral Tacrotaj therapy should commence at a dose of 0.075 mg/kg/day administered as two divided doses (e.g. morning and evening). Administration should commence within 5 days after the completion of surgery as soon as the patient’s clinical condition is stabilised. If the dose cannot be administered orally as a result of the clinical condition of the patient, intravenous therapy of 0.01 to 0.02 mg/kg/day should be initiated as a continuous 24-hour infusion. An alternative strategy was published where oral tacrolimus was administered within 12 hours post transplantation. This approach was reserved for patients without organ dysfunction (e.g. renal dysfunction). In that case, an initial oral tacrolimus dose of 2 to 4 mg per day was used in combination with mycophenolate mofetil and corticosteroids or in combination with sirolimus and corticosteroids. Tacrotaj has been used with or without antibody induction in paediatric heart transplantation. In patients without antibody induction, if Tacrotaj therapy is initiated intravenously, the recommended starting dose is 0.03 – 0.05 mg/kg/day as a continuous 24-hour infusion targeted to achieve tacrolimus whole blood concentrations of 15 – 25 ng/ml. Patients should be converted to oral therapy as soon as clinically practicable. The first dose of oral therapy should be 0.30 mg/kg/day starting 8 to 12 hours after discontinuing intravenous therapy. Following antibody induction, if Tacrotaj therapy is initiated orally, the recommended starting dose is 0.10 – 0.30 mg/kg/day administered as two divided doses (e.g. morning and evening). Tacrotaj doses are usually reduced in the post-transplant period. Post-transplant improvement in the condition of the patient may alter the pharmacokinetics of tacrolimus and may necessitate further dose adjustments. Increased Tacrotaj doses, supplemental corticosteroid therapy, and introduction of short courses of mono-/polyclonal antibodies have all been used to manage rejection episodes. In adult patients converted to Tacrotaj, an initial oral dose of 0.15 mg/kg/day should be administered in two divided doses (e.g. morning and evening). In paediatric patients converted to Tacrotaj, an initial oral dose of 0.20 – 0.30 mg/kg/day should be administered in two divided doses (e.g. morning and evening). The dose recommendations for lung, pancreas and intestinal transplantation are based on limited prospective clinical trial data. In lung-transplanted patients Tacrotaj has been used at an initial oral dose of 0.10 – 0.15 mg/kg/day, in pancreas-transplanted patients at an initial oral dose of 0.2 mg/kg/day and in intestinal transplantation at an initial oral dose of 0.3 mg/kg/day. Dose reduction may be necessary in patients with severe liver impairment in order to maintain the blood trough levels within the recommended target range. As the pharmacokinetics of tacrolimus are unaffected by renal function, no dose adjustment should be required. However, owing to the nephrotoxic potential of tacrolimus careful monitoring of renal function is recommended (including serial serum creatinine concentrations, calculation of creatinine clearance and monitoring of urine output). In general, paediatric patients require doses 1½ – 2 times higher than the adult doses to achieve similar blood levels. There is no evidence currently available to indicate that dosing should be adjusted in older people. Care should be taken when converting patients from ciclosporin-based to Tacrotaj-based therapy (see sections 4.4 and 4.5). Tacrotaj therapy should be initiated after considering ciclosporin blood concentrations and the clinical condition of the patient. Dosing should be delayed in the presence of elevated ciclosporin blood levels. In practice, Tacrotaj therapy has been initiated 12 – 24 hours after discontinuation of ciclosporin. Monitoring of ciclosporin blood levels should be continued following conversion as the clearance of ciclosporin might be affected. Dosing should primarily be based on clinical assessments of rejection and tolerability in each individual patient. As an aid to optimise dosing, several immunoassays are available for determining tacrolimus concentrations in whole blood including a semi-automated microparticle enzyme immunoassay (MEIA). Comparisons of concentrations from the published literature to individual values in clinical practice should be assessed with care and knowledge of the assay methods employed. In current clinical practice, whole blood levels are monitored using immunoassay methods. Blood trough levels of tacrolimus should be monitored during the post-transplantation period. When dosed orally, blood trough levels should be drawn approximately 12 hours post-dosing, just prior to the next dose. The frequency of blood level monitoring should be based on clinical needs. As Tacrotaj is a medicinal product with low clearance, adjustments to the dosage regimen may take several days before changes in blood levels are apparent. Blood trough levels should be monitored approximately twice weekly during the early post-transplant period and then periodically during maintenance therapy. Blood trough levels of tacrolimus should also be monitored following dose adjustment, changes in the immunosuppressive regimen, or following co-administration of substances which may alter tacrolimus whole blood concentrations (see section 4.5). Clinical study analysis suggests that the majority of patients can be successfully managed if tacrolimus blood trough levels are maintained below 20 ng/ml. It is necessary to consider the clinical condition of the patient when interpreting whole blood levels. In clinical practice, whole blood trough levels have generally been in the range 5 – 20 ng/ml in liver transplant recipients and 10 – 20 ng/ml in kidney and heart transplant patients in the early post-transplant period. Subsequently, during maintenance therapy, blood concentrations have generally been in the range of 5 – 15 ng/ml in liver, kidney and heart transplant recipients. Hypersensitivity to tacrolimus or other macrolides. Hypersensitivity to any of the excipients listed in section 6.1. Medication errors, including inadvertent, unintentional or unsupervised substitution of immediate- or prolonged-release tacrolimus formulations, have been observed. This has led to serious adverse events, including graft rejection, or other side effects which could be a consequence of either under- or over-exposure to tacrolimus. Patients should be maintained on a single formulation of tacrolimus with the corresponding daily dosing regimen; alterations in formulation or regimen should only take place under the close supervision of a transplant specialist (see sections 4.2 and 4.8). During the initial post-transplant period, monitoring of the following parameters should be undertaken on a routine basis: blood pressure, ECG, neurological and visual status, fasting blood glucose levels, electrolytes (particularly potassium), liver and renal function tests, haematology parameters, coagulation values, and plasma protein determinations. If clinically relevant changes are seen, adjustments of the immunosuppressive regimen should be considered. When substances with a potential for interaction (see section 4.5) – particularly strong inhibitors of CYP3A4 (such as telaprevir, boceprevir, ritonavir, ketoconazole, voriconazole, itraconazole, telithromycin or clarithromycin) or inducers of CYP3A4 (such as rifampicin, rifabutin) – are being combined with tacrolimus, tacrolimus blood levels should be monitored to adjust the tacrolimus dose as appropriate in order to maintain similar tacrolimus exposure. Herbal preparations containing St. John’s wort (Hypericum perforatum) or other herbal preparations should be avoided when taking Tacrotaj due to the risk of interactions that lead to either a decrease in blood concentrations of tacrolimus and reduced clinical effect of tacrolimus, or an increase in blood concentrations of tacrolimus and risk of tacrolimus toxicity (see section 4.5). The combined administration of ciclosporin and tacrolimus should be avoided and care should be taken when administering tacrolimus to patients who have previously received ciclosporin (see sections 4.2 and 4.5). High potassium intake or potassium-sparing diuretics should be avoided (see section 4.5). Certain combinations of tacrolimus with drugs known to have nephrotoxic or neurotoxic effects may increase the risk of these effects (see section 4.5). Immunosuppressants may affect the response to vaccination and vaccination during treatment with tacrolimus may be less effective. The use of live attenuated vaccines should be avoided. Gastrointestinal perforation has been reported in patients treated with tacrolimus. As gastrointestinal perforation is a medically important event that may lead to a life-threatening or serious condition, adequate treatments should be considered immediately after suspected symptoms or signs occur. Since levels of tacrolimus in blood may significantly change during diarrhoea episodes, extra monitoring of tacrolimus concentrations is recommended during episodes of diarrhoea. Ventricular hypertrophy or hypertrophy of the septum, reported as cardiomyopathies, have been observed on rare occasions. Most cases have been reversible, occurring primarily in children with tacrolimus blood trough concentrations much higher than the recommended maximum levels. Other factors observed to increase the risk of these clinical conditions included pre-existing heart disease, corticosteroid usage, hypertension, renal or hepatic dysfunction, infections, fluid overload, and oedema. Accordingly, high-risk patients, particularly young children and those receiving substantial immunosuppression should be monitored, using such procedures as echocardiography or ECG pre- and post-transplant (e.g. initially at three months and then at 9-12 months). If abnormalities develop, dose reduction of Tacrotaj therapy, or change of treatment to another immunosuppressive agent should be considered. Tacrolimus may prolong the QT interval and may cause Torsades de Pointes. Caution should be exercised in patients with risk factors for QT prolongation, including patients with a personal or family history of QT prolongation, congestive heart failure, bradyarrhythmias and electrolyte abnormalities. Caution should also be exercised in patients diagnosed or suspected to have Congenital Long QT Syndrome or acquired QT prolongation or patients on concomitant medications known to prolong the QT interval, induce electrolyte abnormalities or known to increase tacrolimus exposure (see section 4.5). Patients treated with Tacrotaj have been reported to develop Epstein-Barr Virus (EBV)-associated lymphoproliferative disorders (see section 4.8). Patients switched to Tacrotaj therapy should not receive anti-lymphocyte treatment concomitantly. Very young (< 2 years), EBV-VCA-negative children have been reported to have an increased risk of developing lymphoproliferative disorders. Therefore, in this patient group, EBV-VCA serology should be ascertained before starting treatment with Tacrotaj. During treatment, careful monitoring with EBV-PCR is recommended. Positive EBV-PCR may persist for months and is per se not indicative of lymphoproliferative disease or lymphoma. As with other immunosuppressive agents, owing to the potential risk of malignant skin changes, exposure to sunlight and UV light should be limited by wearing protective clothing and using a sunscreen with a high protection factor. As with other potent immunosuppressive compounds, the risk of secondary cancer is unknown (see section 4.8). Patients treated with tacrolimus have been reported to develop posterior reversible encephalopathy syndrome (PRES). If patients taking tacrolimus present with symptoms indicating PRES such as headache, altered mental status, seizures, and visual disturbances, a radiological procedure (e.g. MRI) should be performed. If PRES is diagnosed, adequate blood pressure control and immediate discontinuation of systemic tacrolimus is advised. Most patients completely recover after appropriate measures are taken. Patients treated with immunosuppressants, including Tacrotaj are at increased risk of opportunistic infections (bacterial, fungal, viral and protozoal). Among these conditions are BK virus associated nephropathy and JC virus associated progressive multifocal leukoencephalopathy (PML). These infections are often related to a high total immunosuppressive burden and may lead to serious or fatal conditions that physicians should consider in patients with deteriorating renal function or neurological symptoms. Cases of pure red cell aplasia (PRCA) have been reported in patients treated with tacrolimus. All patients reported risk factors for PRCA such as parvovirus B19 infection, underlying disease or concomitant medications associated with PRCA. As Tacrotaj contains lactose, special care should be taken in patients with rare hereditary problems of galactose intolerance, the Lapp lactase deficiency or glucose-galactose malabsorption. The printing ink used to mark Tacrotaj capsules 0.5 mg and 1 mg contains soya lecithin. In patients who are hypersensitive to peanut or soya, the risk and severity of hypersensitivity should be weighed against the benefit of using Tacrotaj. Systemically available tacrolimus is metabolised by hepatic CYP3A4. There is also evidence of gastrointestinal metabolism by CYP3A4 in the intestinal wall. Concomitant use of medicinal products or herbal remedies known to inhibit or induce CYP3A4 may affect the metabolism of tacrolimus and thereby increase or decrease tacrolimus blood levels. It is therefore strongly recommended to closely monitor tacrolimus blood levels, as well as QT prolongation (with ECG), renal function and other side effects, whenever substances which have the potential to alter CYP3A4 metabolism are used concomitantly and to interrupt or adjust the tacrolimus dose as appropriate in order to maintain similar tacrolimus exposure (see sections 4.2 and 4.4). Strong interactions have been observed with antifungal agents such as ketoconazole, fluconazole, itraconazole and voriconazole, the macrolide antibiotic erythromycin, HIV protease inhibitors (e.g. ritonavir, nelfinavir, saquinavir) or HCV protease inhibitors (e.g. telaprevir, boceprevir). Concomitant use of these substances may require decreased tacrolimus doses in nearly all patients. Weaker interactions have been observed with clotrimazole, clarithromycin, josamycin, nifedipine, nicardipine, diltiazem, verapamil, amiodarone, danazol, ethinylestradiol, omeprazole, nefazodone and (Chinese) herbal remedies containing extracts of Schisandra sphenanthera. In vitro the following substances have been shown to be potential inhibitors of tacrolimus metabolism: bromocriptine, cortisone, dapsone, ergotamine, gestodene, lidocaine, mephenytoin, miconazole, midazolam, nilvadipine, norethisterone, quinidine, tamoxifen, troleandomycin. Grapefruit juice has been reported to increase the blood level of tacrolimus and should therefore be avoided. Lansoprazole and ciclosporin may potentially inhibit CYP3A4-mediated metabolism of tacrolimus and thereby increase tacrolimus whole blood concentrations. Tacrolimus is extensively bound to plasma proteins. Possible interactions with other medicinal products known to have high affinity for plasma proteins should be considered (e.g., NSAIDs, oral anticoagulants, or oral antidiabetics). Other potential interactions that may increase systemic exposure of tacrolimus include the prokinetic agent metoclopramide, cimetidine and magnesium-aluminium-hydroxide. Strong interactions have been observed with rifampicin, phenytoin or St. John’s Wort (Hypericum perforatum) which may require increased tacrolimus doses in almost all patients. Clinically significant interactions have also been observed with phenobarbital. Maintenance doses of corticosteroids have been shown to reduce tacrolimus blood levels. High dose prednisolone or methylprednisolone administered for the treatment of acute rejection have the potential to increase or decrease tacrolimus blood levels. Carbamazepine, metamizole and isoniazid have the potential to decrease tacrolimus concentrations. Tacrolimus is a known CYP3A4 inhibitor; thus concomitant use of tacrolimus with medicinal products known to be metabolised by CYP3A4 may affect the metabolism of such medicinal products. The half-life of ciclosporin is prolonged when tacrolimus is given concomitantly. In addition, synergistic/additive nephrotoxic effects can occur. For these reasons, the combined administration of ciclosporin and tacrolimus is not recommended and care should be taken when administering tacrolimus to patients who have previously received ciclosporin (see sections 4.2 and 4.4). Tacrolimus has been shown to increase the blood level of phenytoin. As tacrolimus may reduce the clearance of steroid-based contraceptives leading to increased hormone exposure, particular care should be exercised when deciding upon contraceptive measures. Limited knowledge of interactions between tacrolimus and statins is available. Available data suggests that the pharmacokinetics of statins are largely unaltered by the co-administration of tacrolimus. Animal data have shown that tacrolimus could potentially decrease the clearance and increase the half-life of pentobarbital and phenazone. Concurrent use of tacrolimus with medicinal products known to have nephrotoxic or neurotoxic effects may increase these effects (e.g., aminoglycosides, gyrase inhibitors, vancomycin, sulfamethoxazole+trimethoprim, NSAIDs, ganciclovir or aciclovir). Enhanced nephrotoxicity has been observed following the administration of amphotericin B and ibuprofen in conjunction with tacrolimus. As tacrolimus treatment may be associated with hyperkalaemia, or may increase pre-existing hyperkalaemia, high potassium intake, or potassium-sparing diuretics (e.g., amiloride, triamterene, or spironolactone) should be avoided (see section 4.4). Immunosuppressants may affect the response to vaccination and vaccination during treatment with tacrolimus may be less effective. The use of live attenuated vaccines should be avoided (see section 4.4). Human data show that tacrolimus is able to cross the placenta. Limited data from organ transplant recipients show no evidence of an increased risk of adverse effects on the course and outcome of pregnancy under tacrolimus treatment compared with other immunosuppressive medicinal products. However, cases of spontaneous abortion have been reported. To date, no other relevant epidemiological data are available. Due to the need of treatment, tacrolimus can be considered in pregnant women when there is no safer alternative and when the perceived benefit justifies the potential risk to the foetus. In case of in utero exposure, monitoring of the newborn for the potential adverse effects of tacrolimus is recommended (in particular the effects on the kidneys). There is a risk for premature delivery (<37 week) as well as for hyperkalaemia in the newborn, which, however, normalizes spontaneously. In rats and rabbits, tacrolimus caused embryofoetal toxicity at doses which demonstrated maternal toxicity (see section 5.3). Human data demonstrate that tacrolimus is excreted into breast milk. As detrimental effects on the newborn cannot be excluded, women should not breast-feed whilst receiving Tacrotaj. A negative effect of tacrolimus on male fertility in the form of reduced sperm counts and motility was observed in rats (see section 5.3). Tacrolimus may cause visual and neurological disturbances. This effect may be enhanced if Tacrotaj is administered in association with alcohol. The adverse drug reaction profile associated with immunosuppressive agents is often difficult to establish owing to the underlying disease and the concurrent use of multiple medications. Many of the adverse drug reactions stated below are reversible and/or respond to dose reduction. Oral administration appears to be associated with a lower incidence of adverse drug reactions compared with intravenous use. Adverse drug reactions are listed below in descending order by frequency of occurrence: very common (≥1/10); common (≥1/100, <1/10); uncommon (≥1/1,000, <1/100); rare (≥1/10,000, <1/1,000); very rare (<1/10,000); not known (cannot be estimated from the available data). As is well known for other potent immunosuppressive agents, patients receiving tacrolimus are frequently at increased risk for infections (viral, bacterial, fungal, protozoal). The course of pre-existing infections may be aggravated. Both generalised and localised infections can occur. Cases of BK virus associated nephropathy, as well as cases of JC virus associated progressive multifocal leukoencephalopathy (PML), have been reported in patients treated with immunosuppressants, including Tacrotaj. Patients receiving immunosuppressive therapy are at increased risk of developing malignancies. Benign as well as malignant neoplasms including EBV-associated lymphoproliferative disorders and skin malignancies have been reported in association with tacrolimus treatment. Allergic and anaphylactoid reactions have been observed in patients receiving tacrolimus (see section 4.4). Medication errors, including inadvertent, unintentional or unsupervised substitution of immediate- or prolonged-release tacrolimus formulations, have been observed. A number of associated cases of transplant rejection have been reported (frequency cannot be estimated from available data). Experience with overdosage is limited. Several cases of accidental overdosage have been reported; symptoms have included tremor, headache, nausea and vomiting, infections, urticaria, lethargy, increased blood urea nitrogen and elevated serum creatinine concentrations, and increase in alanine aminotransferase levels. No specific antidote to Tacrotaj therapy is available. If overdosage occurs, general supportive measures and symptomatic treatment should be conducted. Based on its high molecular weight, poor aqueous solubility, and extensive erythrocyte and plasma protein binding, it is anticipated that tacrolimus will not be dialysable. In isolated patients with very high plasma levels, haemofiltration or -diafiltration have been effective in reducing toxic concentrations. In cases of oral intoxication, gastric lavage and/or the use of adsorbents (such as activated charcoal) may be helpful, if used shortly after intake. At the molecular level, the effects of tacrolimus appear to be mediated by binding to a cytosolic protein (FKBP12) which is responsible for the intracellular accumulation of the compound. The FKBP12-tacrolimus complex specifically and competitively binds to and inhibits calcineurin, leading to a calcium-dependent inhibition of T-cell signal transduction pathways, thereby preventing transcription of a discrete set of lymphokine genes. 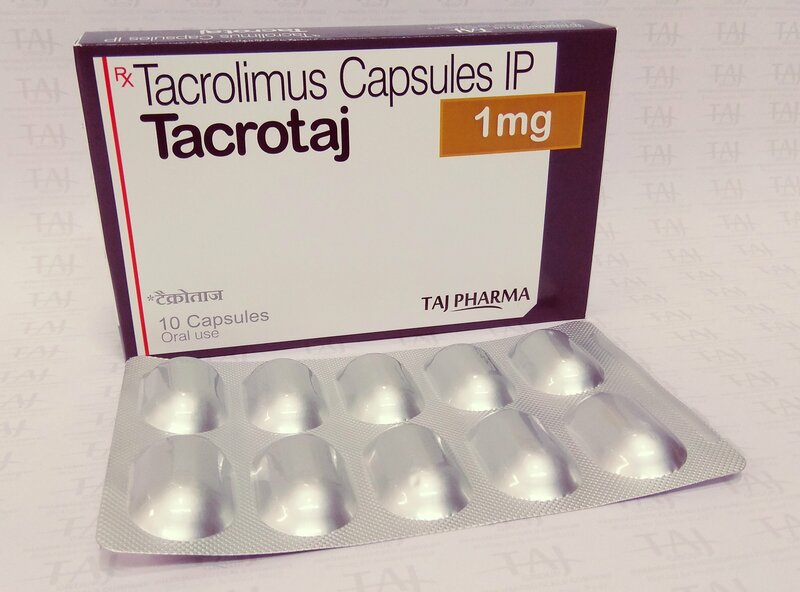 Tacrolimus is a highly potent immunosuppressive agent and has proven activity in both in vitro and in vivo experiments. In particular, tacrolimus inhibits the formation of cytotoxic lymphocytes, which are mainly responsible for graft rejection. Tacrolimus suppresses T-cell activation and T-helper-cell dependent B-cell proliferation, as well as the formation of lymphokines (such as interleukins-2, -3, and γ-interferon) and the expression of the interleukin-2 receptor. Tacrotaj has evolved into an accepted treatment as primary immunosuppressive medicinal product following pancreas, lung and intestinal transplantation. In prospective published studies tacrolimus was investigated as primary immunosuppressant in approximately 175 patients following lung, 475 patients following pancreas and 630 patients following intestinal transplantation. Overall, the safety profile of tacrolimus in these published studies appeared to be similar to what was reported in the large studies, where tacrolimus was used as primary treatment in liver, kidney and heart transplantation. Efficacy results of the largest studies in each indication are summarised below. The interim analysis of a recent multicentre study discussed 110 patients who underwent 1:1 randomisation to either tacrolimus or ciclosporin. Tacrolimus was started as continuous intravenous infusion at a dose of 0.01 to 0.03 mg/kg/day and oral tacrolimus was administered at a dose of 0.05 to 0.3 mg/kg/day. A lower incidence of acute rejection episodes for tacrolimus- versus ciclosporin-treated patients (11.5% versus 22.6%) and a lower incidence of chronic rejection, the bronchiolitis obliterans syndrome (2.86% versus 8.57%), was reported within the first year after transplantation. The 1-year patient survival rate was 80.8% in the tacrolimus and 83% in the ciclosporin group (Treede et al., 3rd ICI San Diego, US, 2004;Abstract 22). Another randomised study included 66 patients on tacrolimus versus 67 patients on ciclosporin. Tacrolimus was started as continuous intravenous infusion at a dose of 0.025 mg/kg/day and oral tacrolimus was administered at a dose of 0.15 mg/kg/day with subsequent dose adjustments to target trough levels of 10 to 20 ng/ml. The 1-year patient survival was 83% in the tacrolimus and 71% in the ciclosporin group, the 2-year survival rates were 76% and 66%, respectively. Acute rejection episodes per 100 patient-days were numerically fewer in the tacrolimus (0.85 episodes) than in the ciclosporin group (1.09 episodes). Obliterative bronchiolitis developed in 21.7% of patients in the tacrolimus group compared with 38.0% of patients in the ciclosporin group (p = 0.025). Significantly more ciclosporin-treated patients (n = 13) required a switch to tacrolimus than tacrolimus-treated patients to ciclosporin (n = 2) (p = 0.02) (Keenan et al., Ann Thoracic Surg 1995;60:580). In an additional two-centre study, 26 patients were randomised to the tacrolimus versus 24 patients to the ciclosporin group. Tacrolimus was started as continuous intravenous infusion at a dose of 0.05 mg/kg/day and oral tacrolimus was administered at a dose of 0.1 to 0.3 mg/kg/day with subsequent dose adjustments to target trough levels of 12 to 15 ng/ml. The 1-year survival rates were 73.1% in the tacrolimus versus 79.2% in the ciclosporin group. Freedom from acute rejection was higher in the tacrolimus group at 6 months (57.7% versus 45.8%) and at 1 year after lung transplantation (50% versus 33.3%) (Treede et al., J Heart Lung Transplant 2001;20:511). The three studies demonstrated similar survival rates. The incidences of acute rejection were numerically lower with tacrolimus in all three studies and one of the studies reported a significantly lower incidence of bronchiolitis obliterans syndrome with tacrolimus. A multicentre study included 205 patients undergoing simultaneous pancreas-kidney transplantation who were randomised to tacrolimus (n=103) or to ciclosporin (n=102). The initial oral per protocol dose of tacrolimus was 0.2 mg/kg/day with subsequent dose adjustments to target trough levels of 8 to 15 ng/ml by Day 5 and 5 to 10 ng/mL after Month 6. Pancreas survival at 1 year was significantly superior with tacrolimus: 91.3% versus 74.5% with ciclosporin (p < 0.0005), whereas renal graft survival was similar in both groups. In total 34 patients switched treatment from ciclosporin to tacrolimus, whereas only 6 tacrolimus patients required alternative therapy (Bechstein et al., Transplantation 2004;77:1221). Published clinical experience from a single centre on the use of tacrolimus for primary treatment following intestinal transplantation showed that the actuarial survival rate of 155 patients (65 intestine alone, 75 liver and intestine, and 25 multivisceral) receiving tacrolimus and prednisone was 75% at 1 year, 54% at 5 years, and 42% at 10 years. In the early years the initial oral dose of tacrolimus was 0.3 mg/kg/day. Results continuously improved with increasing experience over the course of 11 years. A variety of innovations, such as techniques for early detection of Epstein-Barr (EBV) and CMV infections, bone marrow augmentation, the adjunct use of the interleukin-2 antagonist daclizumab, lower initial tacrolimus doses with target trough levels of 10 to 15 ng/ml, and most recently allograft irradiation were considered to have contributed to improved results in this indication over time (Abu-Elmagd et al., Ann Surg 2001;234:404). In man tacrolimus has been shown to be able to be absorbed throughout the gastrointestinal tract. Following oral administration of Tacrotaj capsules peak concentrations (Cmax) of tacrolimus in blood are achieved in approximately 1 – 3 hours. In some patients, tacrolimus appears to be continuously absorbed over a prolonged period yielding a relatively flat absorption profile. The mean oral bioavailability of tacrolimus is in the range of 20% – 25%. After oral administration (0.30 mg/kg/day) to liver transplant patients, steady-state concentrations of Tacrotaj were achieved within 3 days in the majority of patients. In healthy subjects, Tacrotaj 0.5 mg, Tacrotaj 1 mg and Tacrotaj 5 mg Capsules, hard have been shown to be bioequivalent, when administered as equivalent dose. The rate and extent of absorption of tacrolimus is greatest under fasted conditions. The presence of food decreases both the rate and extent of absorption of tacrolimus, the effect being most pronounced after a high-fat meal. The effect of a high-carbohydrate meal is less pronounced. In stable liver transplant patients, the oral bioavailability of Tacrotaj was reduced when it was administered after a meal of moderate fat (34% of calories) content. Decreases in AUC (27%) and Cmax (50%), and an increase in tmax (173%) in whole blood were evident. In a study of stable renal transplant patients who were administered Tacrotaj immediately after a standard continental breakfast the effect on oral bioavailability was less pronounced. Decreases in AUC (2 to 12%) and Cmax (15 to 38%), and an increase in tmax (38 to 80%) in whole blood were evident. Bile flow does not influence the absorption of Tacrotaj. A strong correlation exists between AUC and whole blood trough levels at steady-state. Monitoring of whole blood trough levels therefore provides a good estimate of systemic exposure. In man, the disposition of tacrolimus after intravenous infusion may be described as biphasic. In the systemic circulation, tacrolimus binds strongly to erythrocytes resulting in an approximate 20:1 distribution ratio of whole blood/plasma concentrations. In plasma, tacrolimus is highly bound (> 98.8%) to plasma proteins, mainly to serum albumin and α-1-acid glycoprotein. Tacrolimus is extensively distributed in the body. The steady-state volume of distribution based on plasma concentrations is approximately 1300 l (healthy subjects). Corresponding data based on whole blood averaged 47.6 l.
Tacrolimus is a low-clearance substance. In healthy subjects, the average total body clearance (TBC) estimated from whole blood concentrations was 2.25 l/h. In adult liver, kidney and heart transplant patients, values of 4.1 l/h, 6.7 l/h and 3.9 l/h, respectively, have been observed. Paediatric liver transplant recipients have a TBC approximately twice that of adult liver transplant patients. Factors such as low haematocrit and protein levels, which result in an increase in the unbound fraction of tacrolimus, or corticosteroid-induced increased metabolism are considered to be responsible for the higher clearance rates observed following transplantation. The half-life of tacrolimus is long and variable. In healthy subjects, the mean half-life in whole blood is approximately 43 hours. In adult and paediatric liver transplant patients, it averaged 11.7 hours and 12.4 hours, respectively, compared with 15.6 hours in adult kidney transplant recipients. Increased clearance rates contribute to the shorter half-life observed in transplant recipients. Tacrolimus is widely metabolised in the liver, primarily by the cytochrome P450-3A4. Tacrolimus is also considerably metabolised in the intestinal wall. There are several metabolites identified. Only one of these has been shown in vitro to have immunosuppressive activity similar to that of tacrolimus. The other metabolites have only weak or no immunosuppressive activity. In systemic circulation only one of the inactive metabolites is present at low concentrations. Therefore, metabolites do not contribute to pharmacological activity of tacrolimus. Following intravenous and oral administration of 14C-labelled tacrolimus, most of the radioactivity was eliminated in the faeces. Approximately 2% of the radioactivity was eliminated in the urine. Less than 1% of unchanged tacrolimus was detected in the urine and faeces, indicating that tacrolimus is almost completely metabolised prior to elimination: bile being the principal route of elimination. The kidneys and the pancreas were the primary organs affected in toxicity studies performed in rats and baboons. In rats, tacrolimus caused toxic effects to the nervous system and the eyes. Reversible cardiotoxic effects were observed in rabbits following intravenous administration of tacrolimus. When tacrolimus is administered intravenously as rapid infusion/bolus injection at a dose of 0.1 to 1.0 mg/kg, QTc prolongation has been observed in some animal species. Peak blood concentrations achieved with these doses were above 150 ng/mL which is more than 6-fold higher than mean peak concentrations observed with Tacrotaj in clinical transplantation. Embryofoetal toxicity was observed in rats and rabbits and was limited to doses that caused significant toxicity in maternal animals. In rats, female reproductive function including birth was impaired at toxic dosages and the offspring showed reduced birth weights, viability and growth. A negative effect of tacrolimus on male fertility in the form of reduced sperm counts and motility was observed in rats. Capsule content: Hypromellose, Croscarmellose sodium, Lactose monohydrate, Magnesium stearate, Capsule shell: Titanium dioxide (E 171), Yellow iron oxide (E 172), Gelatine, Printing ink of capsule shell: Shellac, lecithin (soya), hydroxypropyl cellulose, simeticone, red iron oxide (E 172). Tacrolimus is not compatible with PVC. Tubing, syringes and other equipment used to prepare or administer a suspension of Tacrotaj capsule contents should not contain PVC. Hard capsules should be taken immediately following removal from the blister. PVC/PVDC/Aluminium blisters or PVC/PVDC/Aluminium perforated unit-dose blisters. Ten capsules per blister. Two, three, five, six, nine or ten blisters with a desiccant in an aluminium wrapper. Packs of 10, 30, 50, 60 and 100 hard capsules in blisters. Packs of 10×1, 30×1, 50×1, 60×1 and 100×1 hard capsules in perforated unit-dose blisters. Packs of 10, 30, 50, 60, 90 and 100 hard capsules in blisters. Packs of 20×1, 30×1, 50×1, 60×1, 90×1 and 100×1 hard capsules in perforated unit-dose blisters. Packs of 10, 50, 60 and 100 hard capsules in blisters. Packs of 10×1, 50×1, 60×1 and 100×1 hard capsules in perforated unit-dose blisters.